The parallels between the impending development to the west, at 27 East 4th Street, and the tragedy that occurred in 1988, when the Merchant’s House was threatened with development to the east, are frightening. 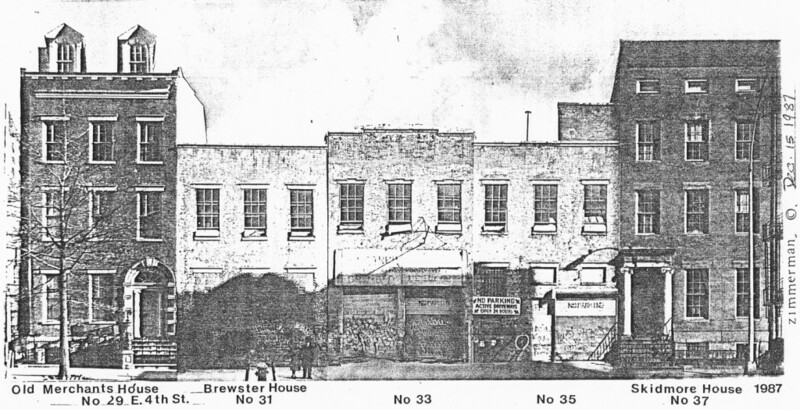 In July 1987, the three 19th-century buildings to the east of the Merchant’s House were sold to a developer for demolition and the construction of a residential building. Meeting after meeting after meeting took place, with the Landmarks Preservation Commission, Merchant’s House consulting engineers and architects, the developers’ engineers, Council members, and neighborhood groups, to discuss ways to protect the house from damage. Protection never happened. On May 10, the developers bulldozed the buildings to the east, causing major structural damage to the Merchant’s House. The Museum was closed to the public for most of the 2 ½ years it took to restore the house. Repairs cost close to $1 million, in large part paid for by the Museum. And the Merchant’s House continues to suffer the effects today. We can’t – we won’t! – let this happen again.